Module 1 covers ‘Responsible Forest Management in the U.S. and Canada,’ including an overview of the significance and importance of the forest landscape in these countries, a review of the responsible forestry practices in this region, and a discussion on how responsible forest management can help companies both manage risks and enhance the benefits of forests. Forests are present across the globe, covering approximately 31% of the world’s land surface. They thrive in diverse climatic regions throughout the world. 15.5% of the world’s forests are in Canada and the United States. Canada has the 3rd largest forest area in the world and the United States has the 4th largest forest area in the world. These 2 countries are only exceeded only by the Russian Federation, and Brazil in terms of forested area. Canada’s forests cover 42% of its land (990 million acres of forests). Approximately 80% of Canada’s forested land is in the immense boreal forest region. Characterized by coniferous trees (evergreens) and a subarctic climate in the Northern Hemisphere. The United States’ forests cover about 30% of its land (747 million acres), and include an incredible diversity of forest types, reflecting the U.S.’s geological and climate diversity. The Southern United States is home to the nation’s most heavily forested region, making up close to ⅓ of total U.S. forest land. In Canada, most forests are publicly owned. 90% of Canada’s forests are owned by the provinces and territories and managed through forest licenses issued to a variety of users. The 4% of Canada’s forests owned by the federal government are located mainly in national parks, on lands owned by the Department of National Defense, and on lands held in reserve for, or otherwise controlled by, Native Peoples. Only 6% of Canada’s forests are privately owned. This category is made up of large forests owned by the forest sector and small, private woodlots, often family-owned. Both private and public forests contribute to the forest products sector. In the U.S., nearly two-thirds of the forests are privately owned. Of this private owned land, families represent the largest owner group (apx 43%), which includes individuals, families, trusts, estates and family partnerships. They typically own smaller forests (average 66 acres). Large forests are also owned by the forest sector, which is called ‘institutional-ownership’, comprising 16% of ownership. Both family and institutional forests contribute substantially to the country’s wood products sector. Other private forests include conservation and natural resource organization owned forest, unincorporated partnerships and associations, and Native American tribal lands. Federally owned public forests (apx 28%) include many national parks and national forests, with the majority located in the west. State and locally owned forests make up the remaining public owned forestland. State-owned forest lands are larger contributors to the country’s wood products sector than federally owned land. Trees in the U.S. and Canada produce a wide range of products, including pulp for writing and reading paper as well as for packaging, fiber that is used in woven products and textiles, lumber for building including industrial roundwood, sawn wood and wood panels. The U.S. and Canada are in the top 4 global producers for all of these products, except for paperboard, where only the U.S. is a top producer. The demand for forest products requires that forests are healthy and well-managed. Therefore, demand for forest products can also motivate forest stewardship, when companies recognize the need to maintain forests to support their industry, meet growing demand, and address the need for sustainability in supply chains. The U.S. and Canada have some of the most stringent forest sustainability regulations in the world as well as sustainable forest industry practices. At the same time the U.S. and Canada are among the world’s top forest product producers. It’s this responsible management that enables U.S. and Canadian forests to be so productive, while ensuring the continued guarantee of conservation and environmental outcomes so important to the public. Both the U.S. and Canada have vast areas of forests that are “reserved” for non-commercial uses and focused on enabling conservation outcomes like critical habitat and watershed management. This occurs in both wilderness areas and parks managed by federal, regional and local programs and local land trusts, as well as areas inside of managed, working forests that are set aside, or otherwise specifically managed for conservation outcomes, effectively ensuring biodiversity and other benefits at a continental scale. The U.S. and Canada also have more certified forests than any other region. There are more than 480 million acres of third-party certified forests in the two countries, representing nearly half of the world’s certified forests. Only a small percentage of working forests are harvested annually, <2% in the US and <.05% in CA. This level of harvest meets the first critical test of “sustainability”, in that it represents a harvest rate that is less than annual growth. This wood harvested from these “working forests” plays a critical role in the global economy and provide key material inputs to society as well as employment. Working forests also provide goods and services that are not necessarily generating of revenue, including quality of life, biodiversity, water, clean air, carbon sequestration, etc. WRI defines working forests as “forests that are actively managed to generate revenue from multiple sources, including sustainably produced timber and other ecosystem services, and thus are not converted to other land uses such as residential development.” These can include both large commercial forests as well as small, family owned or government owned forests that are on occasion harvested, and thus contribute to the forest economy. 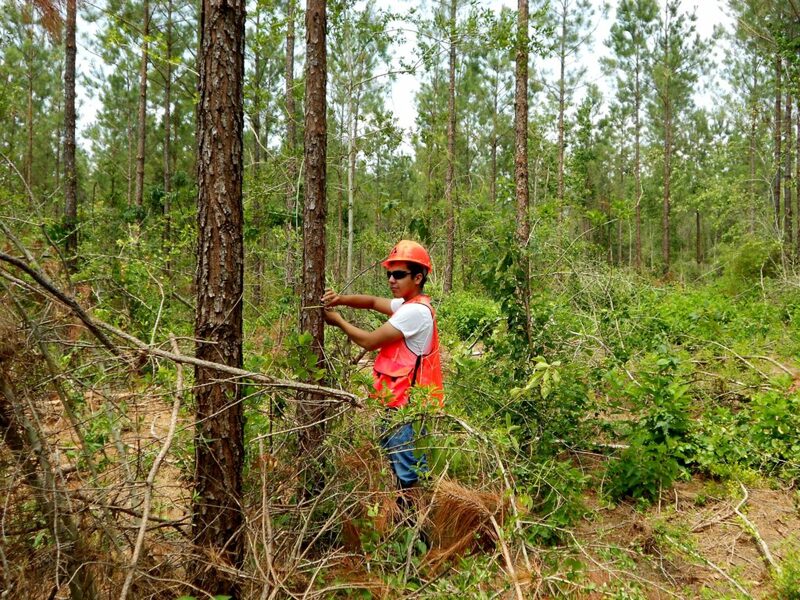 Responsible Forest Management, which can also be called Sustainable Forestry, is a critical component of ensuring forests can meet commercial as well as environmental and social needs. SFI defines sustainable forestry as “To meet the needs of the present without compromising the ability of future generations to meet their own needs by practicing a land stewardship ethic that integrates reforestation and the managing, growing, nurturing and harvesting of trees for useful products and ecosystem services”. Deforestation occurs when forests are permanently converted to other land uses. This conversion means that the multiple values and environmental services produced by forests are lost. Many countries in the world (outside of the U.S. and Canada) lack rigorous protection for forests or lack strong rule of law to enforce protections that keep forests from being cleared for other uses, or do not ensure the sustainable harvesting and use of forest resources. Responsible Forest Management practices, which are the responsible cycle of harvesting wood for forest products and the regeneration / replanting of forests, do not include deforestation. It’s important to ensure that, in our zeal to address the critical issue of forest loss, policies or metrics don’t confuse harvesting in well-managed forests with deforestation. This is particularly important when those managed forests are harvested under assurances of long-term sustainability. Responsible Forest Management also does not include illegal production, and logging that occurs in places without strong laws. Real deforestation occurs when forests are converted to other land uses, such that the multitude of values emanating from that forest, from biodiversity and water filtration to the unfulfilled value of future products and recreation, are forever lost from the realm of opportunity. Outside the U.S. and Canada, the loss of forestlands continues at a significant rate, predominantly in developing, tropical countries. More than 80% of deforestation between 2010 and 2030 is likely to happen in just 11 places – none of which are in NA. Agriculture is estimated to be the proximate driver for around 80% of deforestation worldwide, both big and small scale (commercial and subsistence). Developing nations have a challenge of balancing the needs of responsible forestry and the needs for agriculture to feed a growing populations and create economic opportunities. Mining, infrastructure and urban expansion are also important drivers in many of these countries. In (sub)tropical Asia, conversion of natural forest to non-native tree plantations also threatens forests. Illegal logging activities is another cause of deforestation in many developing countries. The root causes for illegal logging include poverty, weak governance and corruption. Forests still cover about a third of the world’s land area, but areas half the size of England are lost each year, according to National Geographic. Forest destruction produces as much as 15% of the world’s greenhouse gas emissions — more than from all the planes, trains and automobiles on Earth, according to The Nature Conservancy. 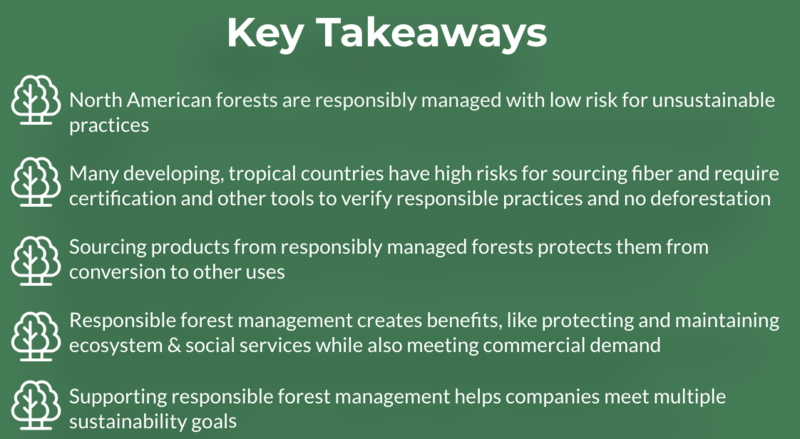 There are therefore real concerns in the global sourcing of forest products from these areas, which presents risks to companies which use forest products in their supply chain. In terms of legal risks, illegal logging can lead to jail time under The Lacey Act in the U.S. for example, which requires companies to eliminate illegal fiber from their supply chain, and there are other similar legislations in the EU (the EU Timber Regulation (EUTR)) and in Australia (the Australian Illegal Logging Prohibition Regulation (ILPR)). There is also reputational risk to companies when consumers determine that deforestation is occurring in their supply chain, which can result from NGO campaigns. Because of these risks, many companies have adopted ‘deforestation free’ commitments. 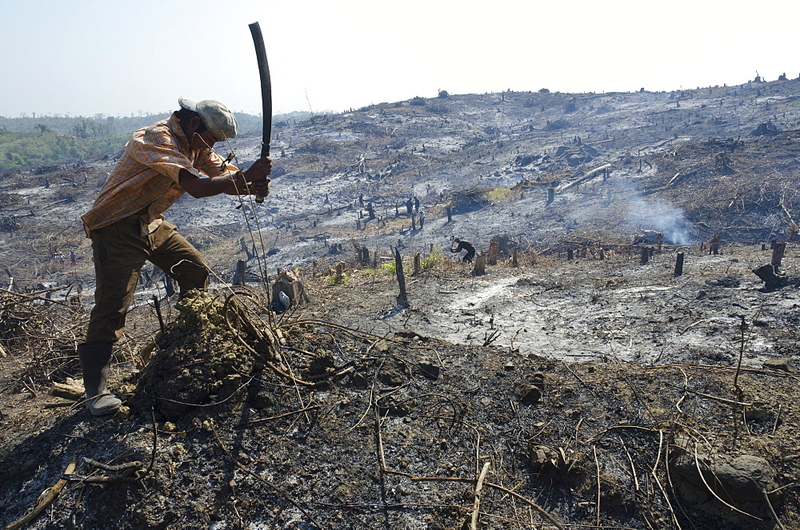 There are different definitions of ‘deforestation free’ relative to corporate commitments. Zero deforestation means that no forest areas are cleared or converted to a non-forest use in order to fuel the supply chain. Zero Net Deforestation means no change to the total forested area, and therefore new forests that are planted can compensate for forests that have been converted to non-forest use elsewhere. Zero Net Deforestation and Forest Degradation (ZNDD) means that there is no overall loss of forest area or forest quality, which considers differences in quality or relative importance of different forests in providing social value or ecosystem services, as this can vary greatly between regions and micro climates. Despite the good intentions of deforestation-free commitments, they can sometimes also result in unintended consequences when companies reduce their use of forest products. By reducing demand for forest products, you reduce demand for working forests, and decrease the ability of forest managers to continue to generate revenue to keep managing their forests, which may put forests at increased risk for conversion to other uses if landowners decide to sell their private forests for another use. The Consumer Goods Forum, which is made up of hundreds of companies, made a public commitment in 2010 to achieving zero-net deforestation by 2020. Many companies’ deforestation policies came from this commitment. They recommend a policy for how members can achieve this, including: Developing sourcing policies that avoid controversial sources known to be contributing to deforestation; Verifying supply from high priority countries where there is risk of deforestation; and disclosing company policies goals and progress to avoid these controversial sources. They list high priority countries where the risk is great for deforestation to occur. The U.S. and Canada are not listed among those high risk countries. 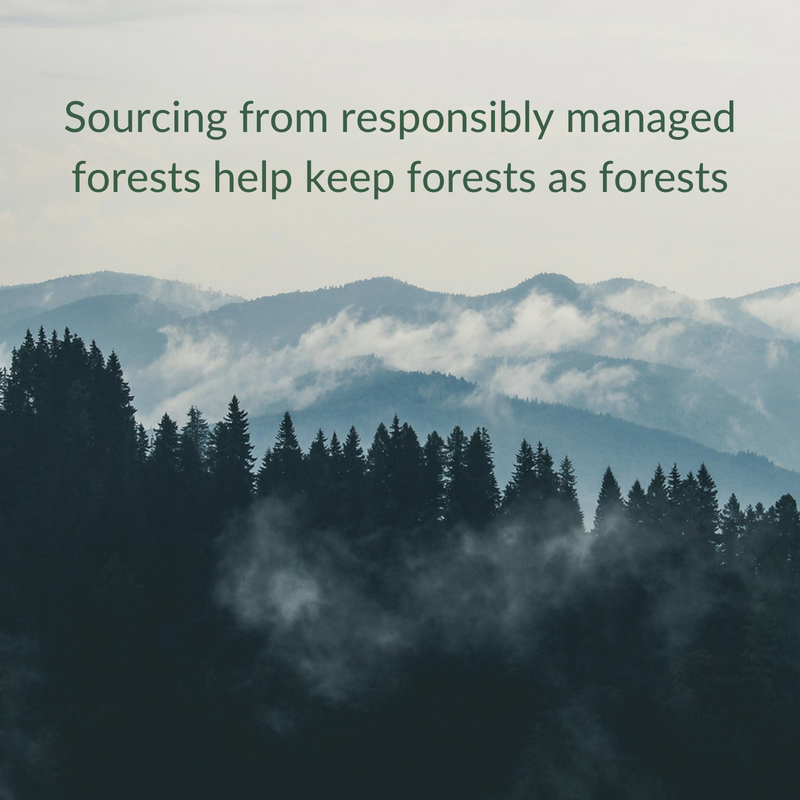 Demand for forest products from Responsibly Managed Forests therefore helps keep Forests as Forests. Robust markets help private landowners have incentives to keep forests working and well managed, and without them, private landowners might sell their forests to other uses which could result in the permanent loss of the forest. The demand for products sourced from responsibly managed forests then in turn drives conservation outcomes. When responsible forest management plans are correctly implemented, harvesting trees can actually help maintain the health and resilience of the forest – since it helps to regenerate new life and in some cases opens up new spaces that create habitat. Responsible forest management practices attend to natural processes to which the forest is adapted, helping to maintain forest health. 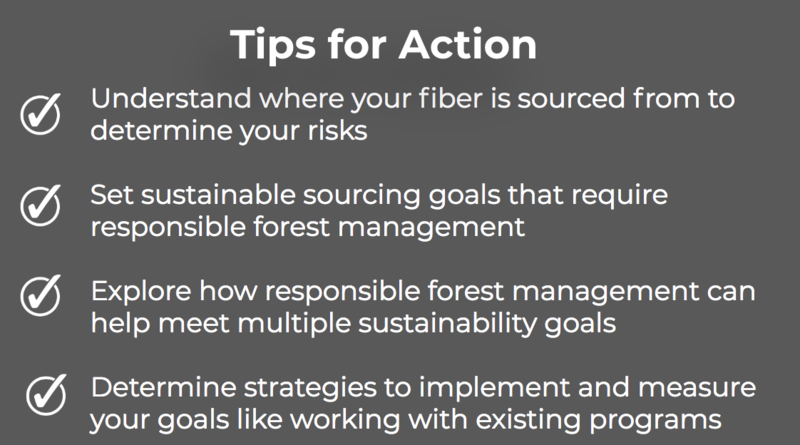 This is an important concept to understand when developing a sustainable fiber sourcing policy. Despite increases in the population in the U.S. and Canada and associated increases in demand for forest products, U.S. and Canadian forests have been well managed and successfully been able to meet these needs without forest depletion. Net forest growth exceeds removal in the U.S. and has stayed more or less consistent in Canada. This trend demonstrates how the last several decades have seen vast improvements in forest management techniques. Today, loggers are trained in best management practices for water quality, biodiversity and other sustainable forest practice requirements. In addition, professional foresters use forest management planning to consider long term harvest sustainability – ensuring that management practices reflect the needs of local species and conditions, and the regeneration of subsequent generations of trees into a new forest. U.S. and Canada’s forests are low risk. Strong laws provide legal frameworks to help prevent illegal logging thanks to a multi-faceted governance structure for sustainable forest management, which includes well-developed public policies, legislation and regulations, enforcement, regular monitoring, and public reporting. 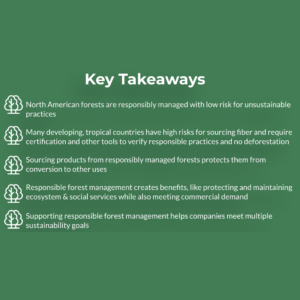 Best practices for sustainable forestry mean that forest managers, and forest product companies have policies and management plans to ensure sustainable harvest levels and require prompt regeneration. And as a developed region, forests in the U.S. and Canada have been managed in balance with agriculture over the last 100 years, a challenge that developing economies are still struggling with. Despite the responsible forest management practices in the U.S. and Canada, forests here still face some threats from invasive species, insects, diseases and fires – many of which are the result of climate change and global trade. For example, the emerald ash borer is native to Asia but now is found in 31 states and the Canadian provinces of Ontario and Quebec, and has been responsible for killing 100s of millions of ash trees. In addition, pressure for urban expansion and development of roads and infrastructure also threaten some forest habitats with fragmentation that can affect ecosystem function, biodiversity, and watersheds critical to forests and humans alike. These various threats to forests are minimized with the emphasis on sustainable forestry practices in the U.S. and Canada, which work towards prompt reforestation, minimized chemical use, and efforts to protect key habitats and protect forests from damaging agents. Responsible forest management therefore helps companies avoid risks in their business and supply chains. Not sourcing from forests considered high risk for unsustainable practices like illegal logging and forest conversion reduces risk for having deforestation occur in company supply chains and reduces risk for legal action against companies. Reducing risky sourcing practices can also stabilize supply, and minimize negative media attention and consumer reputational risk. Credible forest certification programs like the Sustainable Forestry Initiative (SFI)®, Forest Stewardship Council (FSC)® and others are an important element of responsible forest management, helping to ensure risks are avoided. In some cases, they can also serve to help not only avoid risks, but also enhance benefits that forests provide. 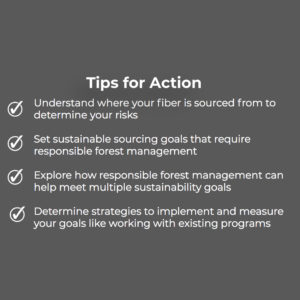 When working forests are responsibly managed, they produce fiber to meet demands of growing population while also providing environmental and social ecosystem services. Because the U.S. and Canada are considered low risk for these global issues, we can focus on the rewards side of responsible forestry, and doing more good. Clean Water – Forests help regulate local and global weather patterns that provide rainfall, and also serve as important source of water storage providing key freshwater resources for agriculture and drinking water worldwide. Forests also provide water purification that plays a key role in water quality, filtering pollutants and runoff from natural and human sources. Globally, forested watersheds and wetlands supply and purify 75% of the worlds accessible freshwater. Climate Regulation – Forests are the largest global storehouses of carbon (after oceans) and their maintenance helps mitigate climate change. Deforestation and land-use changes account for 17% of human-generated carbon dioxide emissions. Forests also decrease the effect of climate change impacts, for example by reducing intensity of urban heat islands and reducing the risk of flooding. Erosion control – Almost half the world’s topsoil has been lost to erosion and deforestation is a direct cause of much of this erosion. Forests create fertile soil as biomass decomposes on the forest floor and is recycled, creating nutrients that plants (our food) require and trees hold this soil in place. Erosion washes away this soil resulting in desertification, damage to aquatic habitats, and directly threatening global food security and threatening communities and ecosystems worldwide. Habitat – Forest lands are vital in maintaining habitat for plants and animals. 80% of the world’s plants and animals live in forests. Deforestation and forest degradation can cause this biodiversity to decline. When forest cover is removed, wildlife is deprived of habitat and become more vulnerable to negative impacts from shifting climate conditions and fragmentation. Up to 28,000 species are expected to become extinct by the next quarter of the century due to deforestation. But responsibly managed forests can provide the habitat needed to sustain or recover species in decline. Indeed, responsibly managed forests can support all of these various ecosystem service benefits. Social benefits. In addition to environmental services, forests provide key services to people and communities. About a third of countries and territories report having forest areas specifically designated for social services. These social services encompass a variety of cultural values and symbolic functions provided by forests. Spiritual & Religious – Forests have mystical significance today for many indigenous groups that use forest sites and products in religious ceremonies and traditions. Other dominant religions globally also recognize the important responsibility of stewarding our natural resources. Cultural heritage – defining unique cuisines, art, music, history language and medicines. In many places, such as the U.S., generations of families care for and live off of the same forest, making them a central part of cultural and family identity. Recreation – Forests provide opportunities for outdoor recreation and tourism that is critically important to many regions of the world that depend on ‘ecotourism’. From hiking to hunting, fishing, bird watching. Education – Forested lands also provide educational services – for students, professionals to learn about local landscapes and natural resource management, and the inherent value of the natural world. Economic benefits: Responsible forest management also provides many benefits to the economy – both the companies and consumers using forest products. Integrating responsible forest management into priorities and procurement priorities helps companies to get stable supply of forest products and to meet the demand for sustainably sourced products. It gives companies positive reputational benefits with communities, governments, and customers and helps enhance forests’ many benefits, like water and air purification, conservation, emissions reduction, and community development – thus helping companies meet multiple sustainability goals. The United Nations Sustainable Development Goals (SDGs) are a universal call to action to end poverty, protect the planet and ensure that all people enjoy peace and prosperity. They touch on social, economic and environmental elements of sustainable development. The 17 SDGs represent the 2030 agenda for sustainable development agreed upon at the UN by governments, civil society and business in 2015. It is highly ambitious and no organization, institution, government or business can achieve it alone. Responsible forest management touches on all of the SDGs. Caring for forests improves everyone’s quality of life as well as supports a healthy planet. For example, responsible forest management gives companies an opportunity to create green jobs and training (SDG 8), work with communities (SDG 11, 4). It can support conservation efforts (SDG 15) resulting in positive impacts on climate change mitigation (SDG 13) and water quality (SDG 6). Responsible sourcing commitments are a great tool to ensure supply chain assurance and that all fiber comes from safe sources (SDG 12). Forest certification programs have done a lot of work in this space to help promote the many benefits of responsible forest management. Since 2013, the American Tree Farm System (ATFS) has provided over $1 million in grants and other funds to help their network of volunteer foresters visit more than 8,900 woodland properties, to forge new relationships with woodland owners who haven’t been active managers of their land in the past and work with them towards promoting good forest stewardship. The Sustainable Forestry Initiative (SFI) also raises environmental awareness through education, community engagement, and research. SFI’s Implementation Committees, a grassroots network of private landowners, loggers, forestry professionals, indigenous people, local governments, and scientists, have provided logger training in key areas like preserving water quality and landowner outreach. The project invested $3.1 million in local communities in 2017 alone and trained over 11,000 resource and harvesting professionals. Supporting responsible forest management helps companies meet multiple sustainability goals like climate change reduction, water quality and support for biodiversity.